I have been overwhelmed with my love for SS14 product at the moment! For me ASOS and Topshop have the best folk inspired pieces as well as mixing it in to a bit of vintage to keep it unique. I am going to Glastonbury end of June so my money is being spent on the best festival attire I can get my hands on and boy do we have an amazing choice! Here's my top pieces I have found over the month of May- enjoy! This is the most gorgeous dress and perfect for festival season with the stunning back detailing. The answer to all your festival prayers! 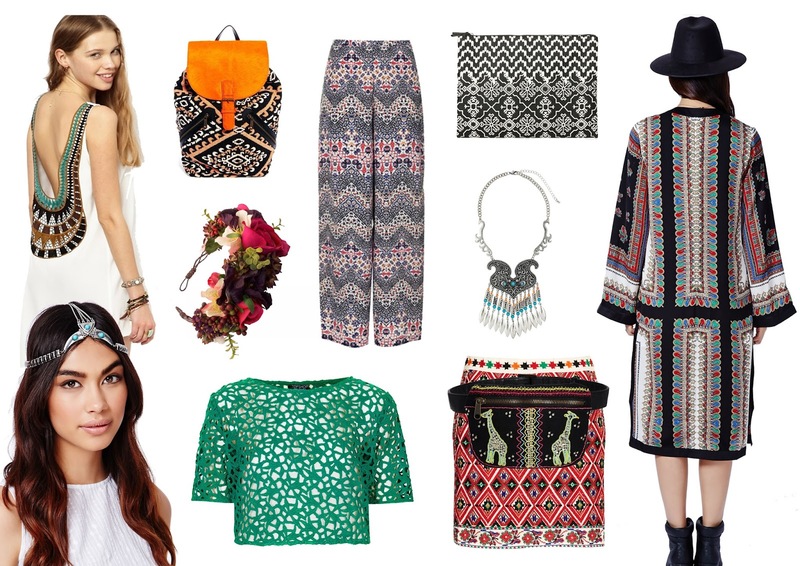 Can fit all your festival essentials in whilst looking super boho chic! A wide trouser is perfect to keep you warm at festival and a great alternative to shorts being super flattering & on trend. AMAZING! One of the most gorgeous kimonos I have seen this season. The print is simply stunning and all over it. A must have SS14 piece! Best snap this beauty up quick guys! Rock N Rose have it bang on with floral headbands and are in a league of there own with their gorgeous unusual flowers and arrays of wonderfulness! This is a gorgeous statement piece to team with your summer bohemian ensembles! Go mad and layer them up. Another great summer wardrobe addition! A really unusual head chain with a beautiful shape and blue stones. Stand out from the crowd with this great piece! I love crochet for summer it always adds texture and interest against pattern and colour. This is a really nice colour and a perfect layering piece to throw on over strappy dresses! This is the perfect little summer mini skirt. Such a statement piece that teaming it with a plain jersey you will still stand out from the crowd. This is a gorgeous little festival piece for keeping your essentials safe and looking good! All of the Topshop pieces are by far my favourites!! Love the feel of this!